DETROIT Auto Show; At the 2007 North American International Auto Show today, Ferrari announced that it ended 2006 with its fourteenth straight annual sales increase, and that it will celebrate its 60th anniversary with a worldwide event for Ferrari owners and their cars. Ferrari sold 5,700 units worldwide in 2006 and 1,635 in North America. That’s a 5.5 percent increase over 2005 sales, according to M. Toscan Bennett, director of public relations and communications for Ferrari North America. With 30 percent of its worldwide sales taking place here, North America is the marque’s most important market. Sales could grow more rapidly in the future, because the company is looking at new markets. "We are looking very carefully (at) what is happening in the fast growing markets, mainly Far East and China," said Amada Felisa, general manager of Ferrari Sp.A. "Of course for a company that makes exclusivity a golden rule, (5,700 units) may seem like a lot of cars," Felisa said. "But if you look to our waiting list you understand that our rate of growth in term of sales is lower than the market request." "The Ferrari 60 Relay" is a relay racing event in which Ferrari owners will drive legs of a route across five continents and fifty countries in 148 days. The rally will start January 28 in Abu Dhabi, where a Ferrari theme park is planned. From the Middle East the rally will move to the Far East, then South Africa, then South America before coming to North America and then on to Europe. The rally will end in Maranello, Italy, the hometown of Ferrari, on June 24. A three-day party will begin June 21. "To commemorate the celebration of the 60 years, we decided to do it in a special way. We want to use this celebration to be focused on our customer," said Felisa. He said he expects at least 10,000 Ferrari owners to take part. The automaker is preparing a series of sixty 612 Scaglietti special editions, each of which will represent one of the 60 finest moments in Ferrari history. 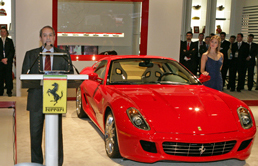 Detroit (USA), 8th January 2007  Ferrari attends the 2007 North American International Auto Show with 3 vehicles on display: the 599 GTB Fiorano, the 612 Scaglietti and the F430 GT. Ferraris booth is located on Stand 5 in Oakland Hall, the traditional home of the Prancing Horse at the Detroit Motor Show. The company, which on January 28th will start the celebration of its 60th anniversary with a worldwide event that will involve the Ferrari owners with their cars of different ages and models and clients (see related release), performed a considerable year, continuing the positive trend of 2005. In 2006, Ferrari delivered 5658 cars to final customers, with a 5% increase on 2005. Accordingly, revenues and trading profit are expected to slightly increase compared to 2005. In 2006, Fiat raised to 85% its interest in Ferrari S.p.A. Mubadala Development Company, the Abu Dhabi investment fund, still keeps 5% stake, while Piero Ferrari holds 10%. The 599 GTB Fiorano boasts absolutely blistering performance with its Enzo Ferrari-derived 5,999 cm3 V12 engine which punches out 620 hp at 7600 rpm. Boasting a power-weight ratio of under 6.1 lbs/hp, a stunning Pininfarina-designed body and an all-aluminum spaceframe developed in collaboration with Alcoa, the 599 GTB Fiorano offers a range of cutting-edge innovations which provide absolutely superior driving pleasure, handling and sportyness. The 599 GTB roars from 0 to 62 mph in an astonishing 3.7 seconds and from 0 to 124 mph in just 11 seconds with a top speed in excess of 205 mph. Courtesy of the ongoing technology transfer from Formula 1 to Ferraris road cars, the 599 GTB Fiorano is equipped with two features that have proved enormously popular with its Formula 1 drivers: the F1-SuperFast gearbox which offers gear shifting in 100 milliseconds, and F1-Trac which optimizes traction. Both features make their road car debut on this model. The 599 GTB Fiorano also boasts other features which that help ensure superior standards of usability, ergonomics and safety engineering: the SCM (magnetorheological fluid suspension system), developed in collaboration with Delphi, which provides improved bump absorption and body control, an enhanced manettino vehicle dynamics control switch, and a wind tunnel-honed body that delivers more downforce with increasing speed. Confirming its international recognition, the 599 GTB Fiorano has garnered very important awards from two of the most respected British magazines like Evo (2006 Evo Car of the Year) and Top Gear (2006 Top Gear Supercar of the Year). Moreover, Classicdriver.com, one of the most important European automotive/lifestyle web sites, awarded the 599 GTB Fiorano Car of the Year 2006. In the United States, Edmunds.com voted the car Editors Most Wanted Exotic. The 612 Scaglietti on display is equipped with the optional Handling GTC pack, targeted at customers who desire a more dynamic handling. The package includes, among other things, a braking system with carbon-ceramic discs (CCM), ball-polished modular wheels and highly-advanced F1 gear change software and a sport exhaust system. Like all of Ferraris road cars, the uniqueness and distinctiveness of the 599 GTB Fiorano can be further enhanced with the Carrozzeria Scaglietti personalization program which for 2007 offers additional new options. The entire range of cars is compatible, for example, with iPod® connectivity via the radio-CD player. The 8-cylinder range is now also available with a two-tone Alcantara® and leather interior as well as ball-polished Challenge wheel rims. The entire Ferrari range can also be treated with an anti-stone chipping protective coating. The Carrozzeria Scaglietti Personalization Program is divided into four distinct areas: Racing and Track, Exteriors and Colors, Interiors and Materials, Equipment and Travel. The program was introduced in 1997 to allow owners to personalize their car to suit their own specific taste and requirements, making each one a genuinely unique vehicle. Since last year, all Ferraris built have included at least some personalization features. Clients may also make non-catalogue special requests which the company will endeavor to meet in the spirit of the work done by Sergio Scaglietti with Ferrari in its earliest days. To preserve the unique heritage of the Prancing Horses surviving classic cars, Ferrari created Ferrari Classiche, a new division providing historic car owners with maintenance, restoration, technical assistance and authenticity certification services. Ferraris Marque development is also progressing apace, thanks both to new licensing contracts (Panerai for luxury watches, Marcolin for eyewear, Microsoft and Sony for video games) and to the excellent performance of existing ones. The companys retail plan continues to globally expand with a significant series of openings in 2007: at the beginning of the year, a new Ferrari store will be inaugurated in Beijing, followed by the Los Angeles boutique, set to open at the Beverly Center. 2006 was the 14th consecutive year of increasing sales for Ferrari North America ending with 1,635 units retailed. This represents a 5.5% increase versus 2005. North America is the most important market for Ferrari, representing approximately 30% of the marques worldwide sales. The Ferrari dealer network is comprised of 36 dealers (32 in the United States, four in Canada) in North America. Ferrari is represented by one authorized dealer in metro Detroit; Cauley Ferrari in West Bloomfield. Ferrari North America Inc., located in Englewood Cliffs, New Jersey, is headed by Maurizio Parlato, President and CEO, now in his fifth year at the helm of Ferraris largest market worldwide. Ferrari North America is the sole importer and distributor of Ferrari sports cars in North America and is responsible for all organization and operating requirements for the Marque in the United States, Canada, Mexico and Central and South America, including the technical training and spare parts service. Ferrari North America has a retail facility on the West Coast of the United States; Ferrari of San Francisco and a corporate showroom located at 410 Park Avenue in New York City. It is not only great products which have made North America Ferraris most successful market. It is also the passion of our clients, the innovation in our marketing platform that we have implemented as an organization and the professionalism of our North American dealer network which has invested more than $80 million in facilities over the last five years said Maurizio Parlato commenting on Ferrari North Americas performance. In order to strengthen and consolidate Ferraris presence in Central and South America, Ferrari S.p.A. has given responsibility to Ferrari North America for countries in this region effective January 1st, 2006. Mexico and Brazil are the key emerging markets in this area. With a total of nine dealers in the region, Ferrari is represented at three outlets in Mexico including Mexico City, Guadalajara and Monterey. In Brazil, there is an authorized dealer in Sao Paolo. Additional dealerships can be found in Buenos Aires, Argentina and Santiago, Chile. In 2006 this region was responsible for approximately 115 sales, compared to approximately 100 in 2005. This consolidation is expected to strengthen the network and improve customer satisfaction in these important emerging markets. Ferrari wishes to congratulate Risi Competizione for winning the 2006 American Le Mans Series Team Championship. The combined efforts of Ferrari North America dealers Giuseppi Risi of Ferrari of Houston, Remo Ferri of Remo Ferri Competizione, Giacomo Mattioli and Art Zafiropoulo of Ferrari of Silicon Valley led to this historic victory at Laguna Seca in last October. Facing stiff competition from Porsche during the season, the team captured seven poles, six fastest laps and won four races. The F430 GT runs in the GT2 class and it is derived from the road-going berlinetta which has proved an excellent starting point for the racing project. It also secured for Ferrari the 2006 FIA Constructors Cup in the category thanks to the results obtained by the private teams that entered the F430 GT with noteworthy victories such as that in the Spa-Francorchamps 24 Hours in Belgium. Ferrari first imported cars officially into the UK in April 1960 through Maranello Concessionaires. In October 2004, Ferrari GB Ltd was formed as a wholly-owned subsidiary of Ferrari S.p.A. and is located in dedicated premises in Slough, from where all operations to support the 15 dealer network in the UK are managed. The UK is Ferraris third largest export market, after the USA and Germany, with 635 cars sold in 2006.